Posted By:Unknown | At:8:18 PM Be the first to comment! SANFORD — Sanford city commissioners have voted "no confidence" in police Chief Bill Lee Jr., who has been publicly lambasted for his department's handling of the fatal shooting of Miami teenager Trayvon Martin. Commissioner Mark McCarty made the motion to fire the chief, who has been on the job just 10 months. Mayor Jeff Triplett and Commissioner Velma Williams voted with the majority. "I take no pleasure in a publicl flogging of our police chief," McCarty said before a packed house. "But he really should turn in his resignation." The vote was 3-2, with Commissioners Randy Jones and Patty Mahany voting against. "A rush to judgment is wrong," said Mahany, who called the vote a "knee-jerk reaction." 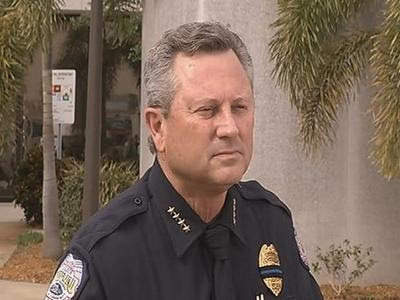 Lee, 52, was hired as chief in May 2011 in the wake of criticism from the black community surrounding the beating of a homeless black man by the son of a Sanford lieutenant. He is not at tonight's meeting. Commissioners can't fire Lee, a Sanford native, because he reports to City Manager Norton Bonaparte Jr. But their vote tonight sends a strong signal. "I'll take that under advisement," said Bonaparte, who became city manager in September. The commission, discussing the topic before a packed house, is taking public comment now. Trayvon's killing has prompted national outrage. Today, Trayvon's parents, Sybrina Fulton and Tracy Martin, attended a "Million Hoodie March" in New York City. "I'm embarrassed by this national shame," Williams said at the meeting. Trayvon, who was wearing a hoodie at the time, was shot Feb. 26 by crime-watch volunteer George Zimmerman in Retreat at Twin Lakes, a gated town-house community in Sanford. Moments before, Zimmerman called police and reported Trayvon as a suspicious person as the 17-year-old walked to his father's fiancee's home after a candy run to 7-Eleven. Zimmerman has claimed self-defense under Florida's 2005 "Stand Your Ground" law, prompting outrage, meetings, marches and calls for Zimmerman's arrest. The law allows people to shoot if they think they are being threatened with serious violenced or death. At an NAACP-sponsored meeting Tuesday night in Sanford, Turner Clayton Jr., president of the Seminole County NAACP, called for the U.S. Department of Justice to take over the Police Department. Others are urging residents to boycott the department if Zimmerman is not arrested by Monday. Clayton tonight applauded commissioners for the no-confidence vote and urged Bonaparte to fire Lee. "It's a start, but it's not enough," Clayton said. "We're asking for his dismissal." Earlier this evening, commissioners decided to move Monday's City Commission meeting to the Sanford Civic Center to accommodate the hundreds of people expected to attend. The civic center, 401 E. Seminole Blvd., holds about 600 people, and the staff plans to put speakers in an adjacent park for overflow crowds. The entire meeting will be devoted to the shooting case in a "town hall" style. Members of Trayvon's family are expected to speak during the 5 p.m. forum. But community and civic leaders say the Sanford Police Department has conducted a shoddy investigation and are demanding Zimmerman's arrest.